Notes: ZZ Smith Research is a research firm trying to make the leap from theoretical and laboratory work to practical space exploration. Having lined up the backing of financier and ESPN World Series of Poker champion Ethan, the team utilizes a community of leaders to determine their direction, represented by globe-trotting actor/singer ZZ, inventor of the left-handed Kerbalshifter and the nuclear engine. This vehicle is designed to get to 10 km in altitude. It was designed with simplicity to limit the possibility of technical malfunction, but it should function well enough while being cheap. There will be a pilot just along for the ride hoping that he does not die. At first it seemed that the rocket was burning through its fuel too quickly but after curtailing the thrust, the ship was easily able to attain 10 km. 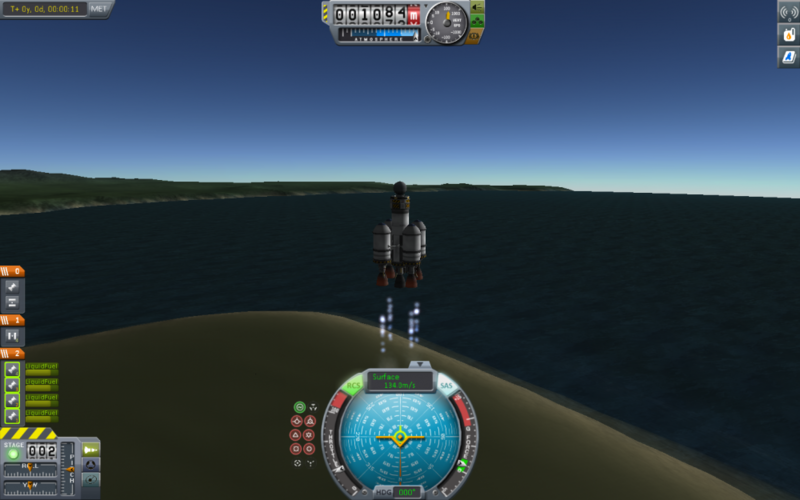 Upon descent, it seemed that the pilot might perish, but the parachute, was able to slow his descent to 6 m/s, which apparently was slow enough to spare his miserable Kerbal life. We successfully launched a craft to 10 km with a Kerbal aboard and brought him back safely. We achieved our goals and brought Kerbal-kind one step closer to greatness. This achieved the milestone of both having a launch to 10 km and a manned launch to 10 km. Given that the Kerbal survived, it would appear that all safety precautions were up to specs and we will continue to hold the same conscientious attitude toward Kerbal safety. We learned that space travel is extremely stressful and that we should not send a Kerbal into space so haphazardly. That being said, our hasty launch netted positive results, demonstrating that it is possible to circumnavigate some preparations in the name of speed. We are more than capable of tackling the next milestone in the space race. However, our next craft, might be more complicated, lending itself to require more research and development. The liquid fuel and engine on the bottom are designed to get the craft up to a high altitude and will be jettisoned once those fuel tanks run out. The smaller tank and engine attached directly to the command pod will get the craft into orbit and should provide enough reserve fuel to get the craft back out of orbit by burning retrograde and causing the craft to descend harmlessly to the planet thanks to the parachute and heat shield which will minimize risk of burning up or crashing and dying. We will get a Kerbal into orbit. This will be done by launching a rocket really high at an angle and then activating thrusters when the craft reaches its apex causing the craft to go into orbit. The brave Kerbal space pilot will fly the craft and be in charge of not dying and enjoying the view of his beautiful home planet from above. He will hopefully not die. 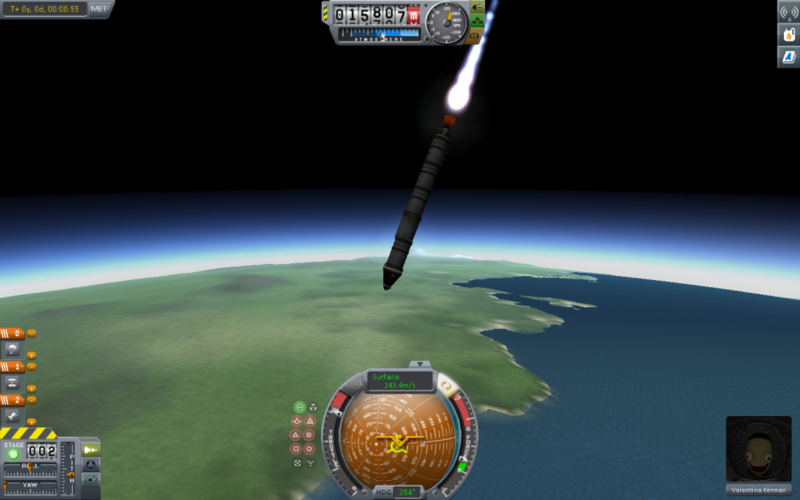 The rocket launched and appeared on its way, but then started to tip and could not be righted so the mission was aborted and the Kerbal was brought back to Earth before he could be fatally injured. This mission was a complete failure and an embarrassment for this organization. Clearly, our lack of scientific knowledge as a team consisting of a poker player and a pop star is a disadvantage. 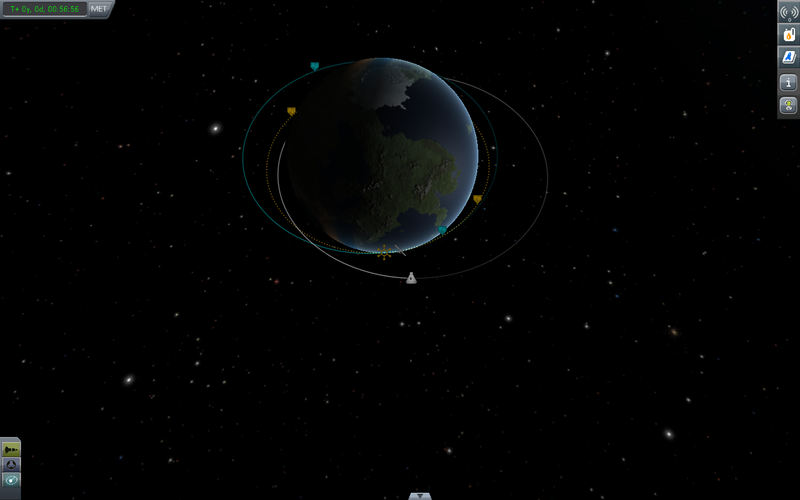 No goals were achieved, but we have learned from our mistakes and no Kerbals were harmed. Our next mission will undoubtedly be more successful. We learned that building a really tall top heavy rocket is a bad strategy and this will be reflected in our next design. We will put a Kerbal into orbit and we will put a Kerbal on the moon by the end of the decade. 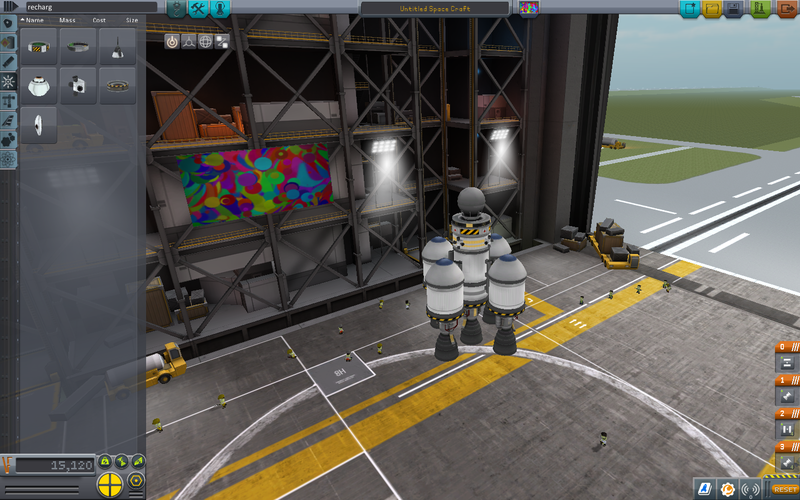 There is a lot of work to do before we will be ready to put a Kerbal into orbit. We will put more effort into research and development so our next mission will succeed. 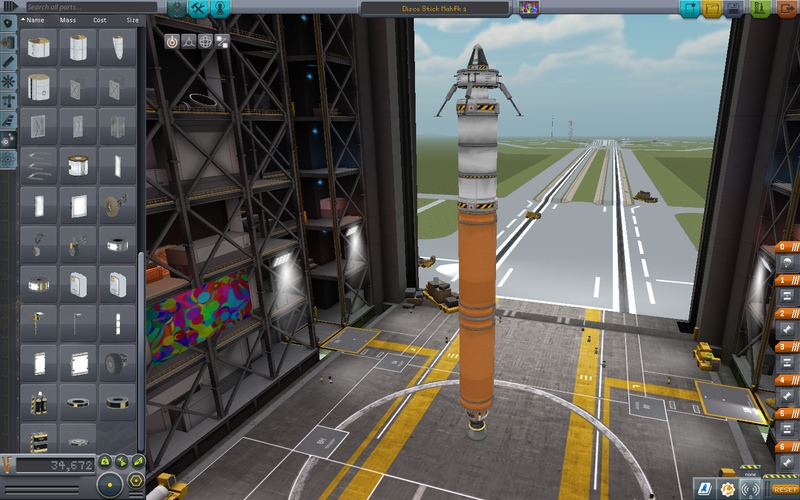 The bottom part of the rocket will make the craft go high then will be decoupled once it runs out of fuel. The secondary engine will get the command pod into orbit and back. The heat shield and parachute will allow the craft to reenter safely hopefully. The goal of this mission is to get a Kerbal into orbit and back home safely so his wife and kids are not abandoned. The ship will be launched then execute a slight gravity turn so that it follows a parabolic path at the apex of which it will execute a maneuver that will send it into orbit. They do not have a life insurance policy, so if he were to die, it would bring financial hardship to that household. The pilot will fly the craft into orbit and try not to die as we hold his fragile life in our clumsy hands. 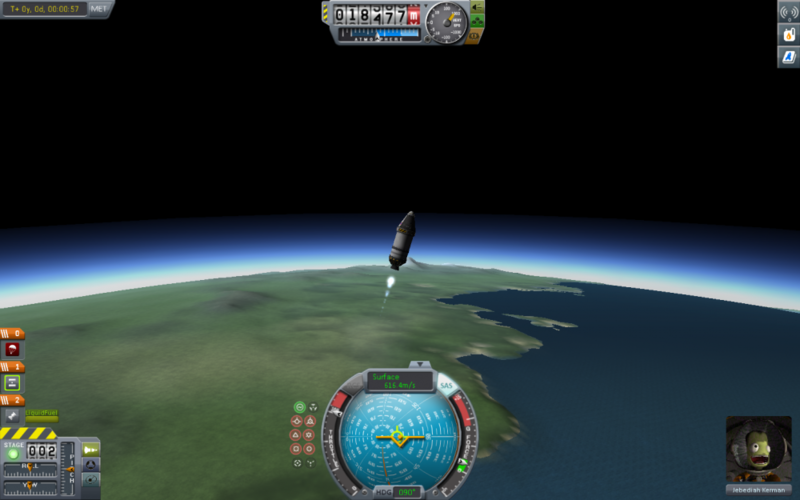 The rocket was launched and accelerated to around 300 m/s. A gravity turn was executed to give the craft a parabolic path and it was ensured that the heading of the rocket lined up with the velocity vector so that torques exerted by air resistance was minimized. The rocket burned through its fuel too quickly and we ran out at 25 km and the first stage was jettisoned. The craft continued to its peak where a maneuver was added to attempt to get the craft into orbit. 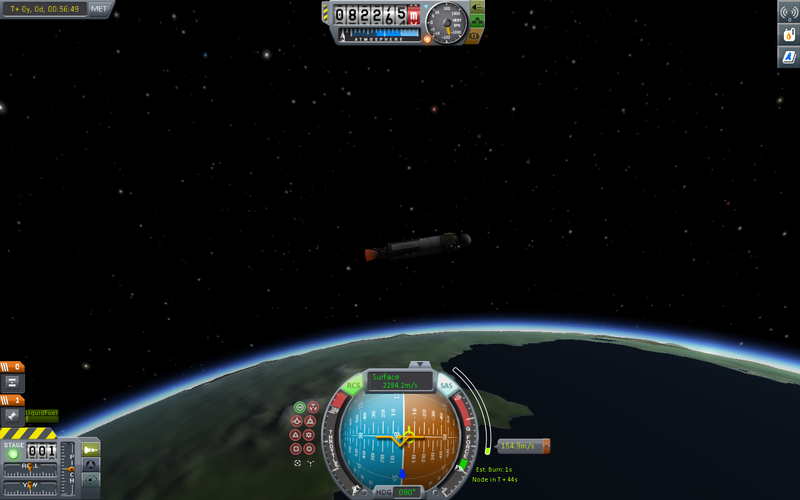 There was not sufficient fuel to get the Kerbal into stable orbit. Upon running out of fuel, the craft began to descend back to Earth. Although it did not burn up in the atmosphere, it did crash into some very tall mountains thus killing poor Jeb and leaving his family without a source of income. We express our sincerest regrets to the family of our Kerbal astronaut and we will pay any fines imposed. 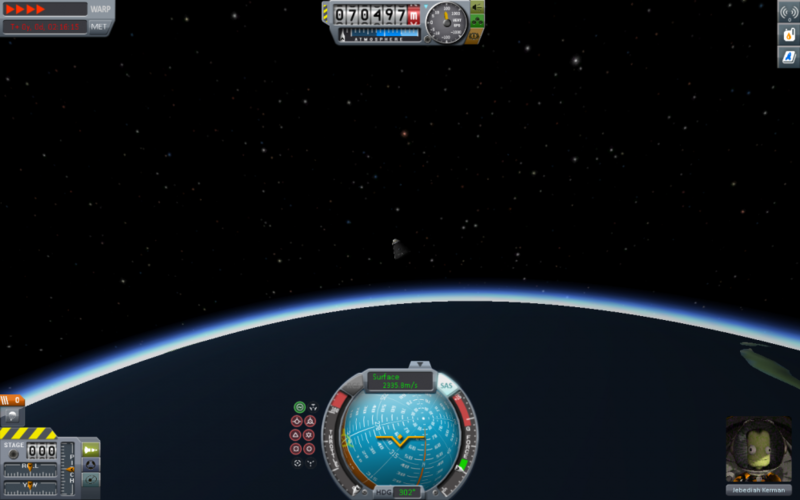 We were within a few kilometers of achieving stable orbit and it was disheartening not to reach it. No milestones were achieved and a Kerbal lost his life unnecessarily. Next time, we will try to land the craft on the light side of the planet, so we can see any mountains that might pose as obstacles. 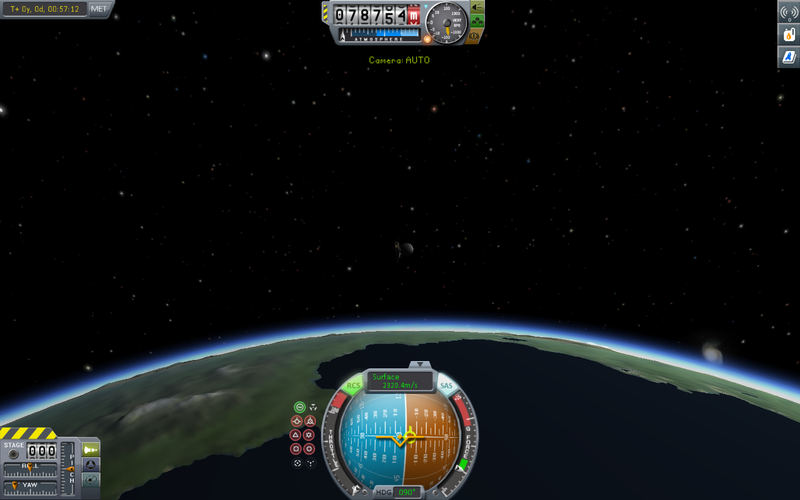 We learned that we are very close to achieving orbit and with a few design tweaks we will be able to send a Kerbal safely into orbit. Space travel is very serious business and we will not lose another Kerbal. Tomorrow we going into orbit, boi. The loss of life was regrettable, but great strides were made in science today that will help our space program be the first to reach orbit. We just need to be more fuel efficient so that we have enough fuel to get to orbit and back. The goal of this mission is to get a Kerbal into orbit and back home safely so his wife and kids are not abandoned. They do not have a life insurance policy, so if he were to die, it would bring financial hardship to that household. 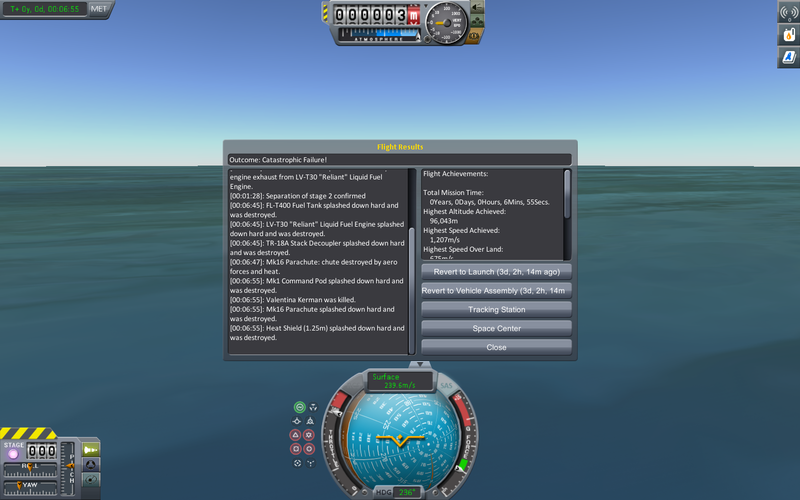 The pilot will fly the craft and once it reaches 100 m/s he will begin to turn the craft to 10 degrees. This will cause gravity to bend the path of the rocket as it accelerates. Once the first stage runs out, the pilot will jettison the initial booster and fuel tanks and activate the second stage. 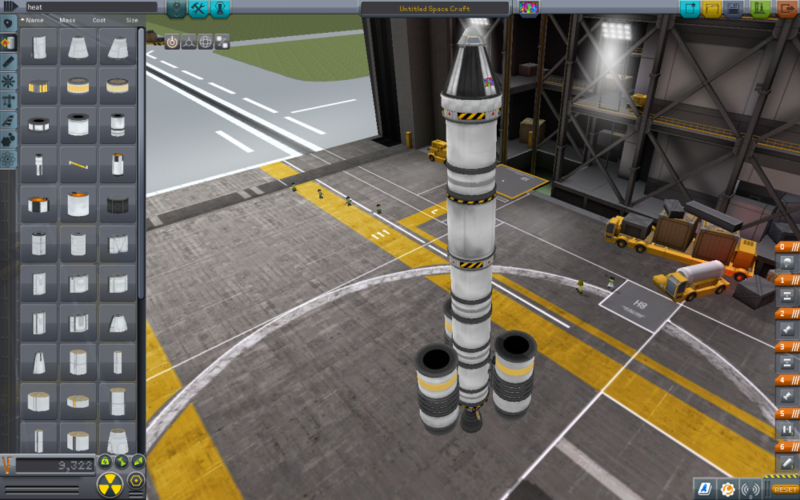 The secondary booster will provide acceleration into space and from there the craft will burn into orbit. Hopefully enough fuel will be left to get home, in which case the pilot will have to keep the heat shield going against the atmosphere and use the parachute to not crash into the ground at high speed. The rocket was launched and accelerated to around 300 m/s. A gravity turn was executed to give the craft a parabolic path and it was ensured that the heading of the rocket lined up with the velocity vector so that torques exerted by air resistance was minimized. 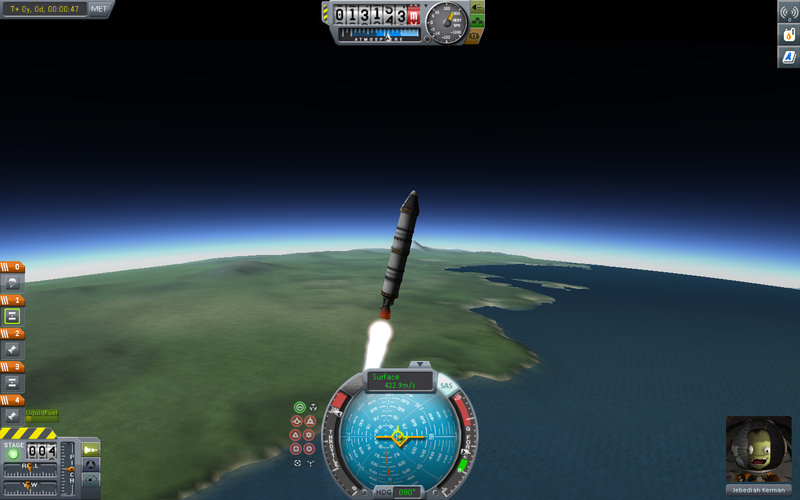 The rocket burned through its fuel too quickly and we ran out at 25 km and the first stage was jettisoned. The craft continued to its peak where a maneuver was added to attempt to get the craft into orbit. 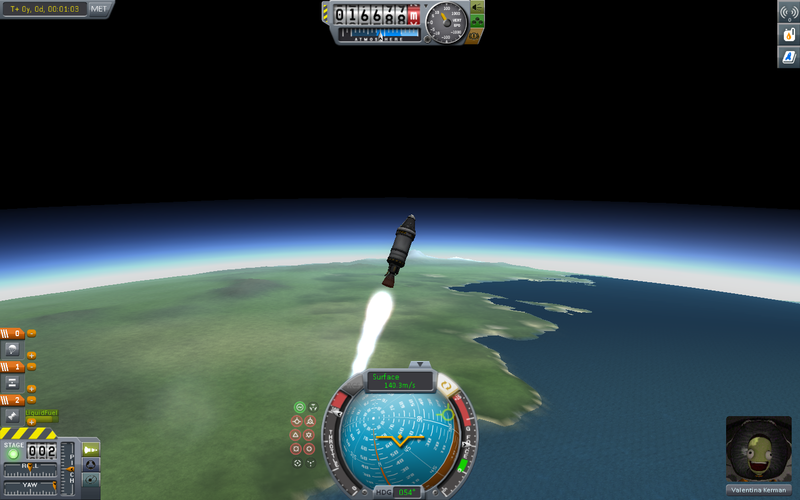 There was not sufficient fuel to get the Kerbal into stable orbit. The craft got exceedingly close, however, so it will be trapped in space for the foreseeable future. The brave pilot is not dead, and we hope that we can advance our program enough that we might one day rescue him. If not, he will eventually descend back to Earth. We were within one kilometer of achieving stable orbit, so the failure to do so is a crippling blow to our space program’s morale. Next time we will build a better rocket that will make it into orbit and beyond. Our fatal flaw was that we did not change the rocket design enough from our last launch. It was still fundamentally flawed in that it didn’t have enough fuel. Our next rocket will be built by a different engineer who will know what he’s doing and give us the best possible spacecraft whatever the cost. We are running out of chances to get into orbit. Another failure will not be tolerated by our program. Next time we will get into orbit or die trying. I think the key phrase in your plan is "Hopefully enough fuel will be left to get home." Hopefully isn't going to be good enough. Before you launch a kerbal into space, you need to know if you have enough fuel to get home. Now is where the strong teams start to plan in more detail, do some research, even attack a few calculations and approximations, to make sure you don't orphan any poor kerbal children. Fine imposed for stranded kerbal: $10,000, plus a stern warning that all appropriate planning and measures to insure the safety of your kerbonauts should be implemented, detailed and logged prior to any future launches. We took the design from our previous rocket that was sadly not able to quite make it into stable orbit as we initially hoped it would. 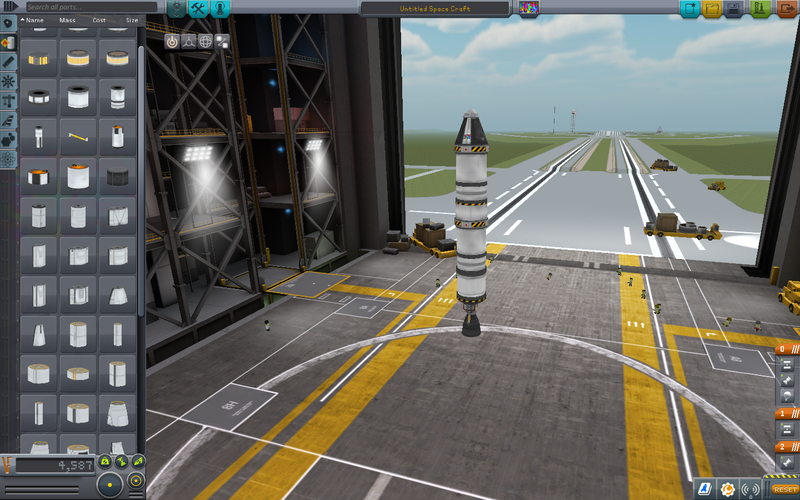 In this one we added three boosters to give it an extra “kick” which will bring our kerbal to and from orbit. We have contracted ZZ's intelligence to craft this work of art. We are hoping to make a feat for all kerbal-kind and to reach and return from the deadly orbit mission. We have failed many times previously, but this isn’t going to stop us from killing more kerbals if need be. Might want to flesh out that plan a bit more... especially some of the details such as what altitude to deploy your parachute. 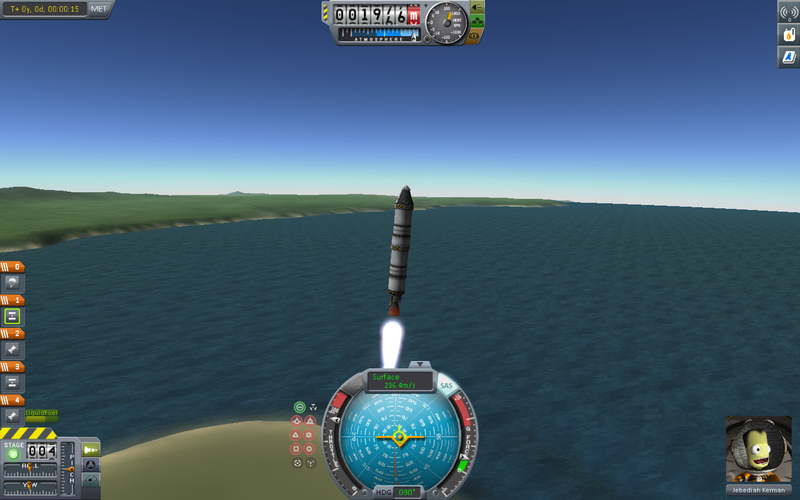 The rocket was launched with the boosters and accelerated to around 300 m/s. A gravity turn was executed to give the craft a parabolic path and it was ensured that the heading of the rocket lined up with the velocity vector so that torques exerted by air resistance was minimized. This gravity, which turned into something that was anything but “slight,” eventually caused a major disproportion in the balancing of CW and CCW torques. Our rocket, as can be observed in the screenshots, ended up plummeting to the surface of the earth at obscene speeds that terrified Valentina Kerbal before her most unfortunate of fortunes. We regretfully will pay any imposed fines, although we never really liked Valentina. We were shockingly far away from our initial goals of this destructive mission. 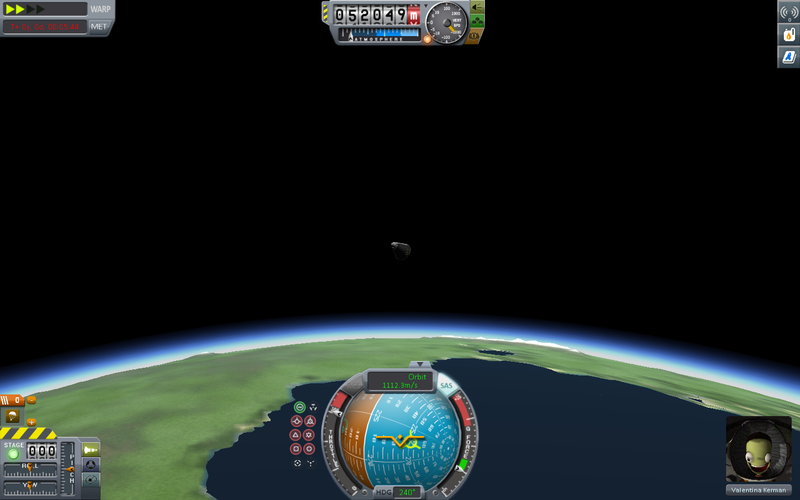 While we did not accomplish our goal, we did manage to almost bring the Kerbal back from 50,000m (but she exploded upon impact). We learned that although we used to be very close, this new design by ZZ was possibly one of the worst in Kerbal history, and Ethan will return as project manager in our next expedition of the unknown. Tomorrow we going into orbit, boi. The loss of life was once again unfortunate, and few strides were made in science today at all. We just need to modify the flight plan of the previous rocket to allow successful orbit. Some things to think about -- why was the rocket unstable? Is there any way to recover / recycle some of your components so that they "don't splash down hard and get destroyed?" This craft is designed to get a satellite into orbit. The initial four rockets will get the craft out of the thick part of the atmosphere and once they are jettisoned the second stage will be activated to get the craft into stable orbit. The rechargeable battery pack will allow the satellite to function for several orbits. We are going to put a satellite into orbit. There will be no Kerbals harmed in this launch. There will be no pilots in our space program until we can prove that we are capable of not being screw ups. The world watched breathlessly as renowned screw-ups attempted to be the first to launch a satellite into space. As the craft lifted off everyone watching thought for sure that the craft would begin to tip and plow into the ground. However, the path of the craft remained stable and straight as an arrow. Upon entering the thinner part of the atmosphere, the craft was turned so that it could achieve a periapsis of above 70,000 meters. Once at periapsis, the craft burned its remaining fuel to get into orbit. 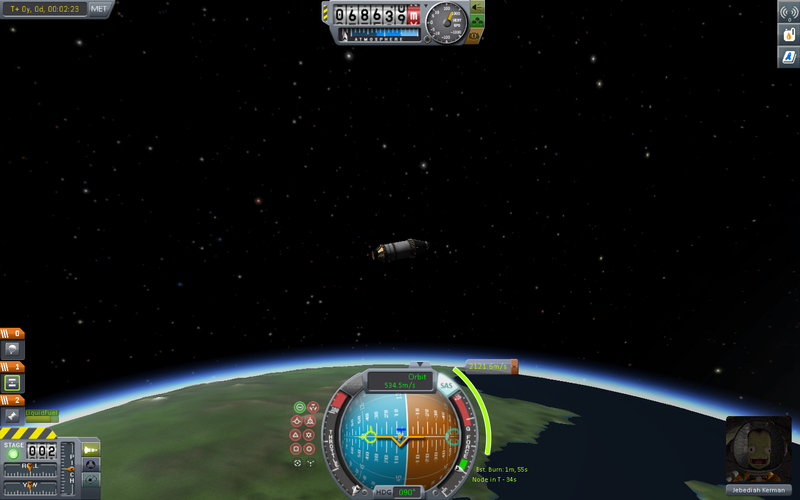 The satellite was then detached and left to float in stable orbit. Summary: For once we achieved our stated goal by putting a satellite into orbit. We learned that if you try enough times, you will eventually succeed, as even a stopped clock is right twice a day. We learned that our space program is not necessarily doomed to fail and that we are not worthless human beings. Our next mission will be even more ambitious and reflect our newfound self-confidence. We will shoot for the moon as soon as possible, but not without proper research and planning. We learned our lesson from the last times. The big fuel tanks and powerful engine on the bottom will get the craft into orbit. Once in orbit, it will decouple and the smaller, more efficient engine will get us to the moon and the even smaller engine will get us to land on it and back. The parachute will give us safe reentry. This rocket must get us to the moon. The pilot will guide the craft into orbit and land it on the moon and be the first Kerbal to walk on the moon and return safely. Have you thought about fuel constraints to not only land, but then take off from the moon, return to Kerbin orbit, and then land safely on Kerbin?